This is the company information of gourmet story. The "gourmet Story" is "taste of the story". Our attitude that to cherish until the merchandise is completed "gourmet story" means. story from before your much merchandise arrives at hand of us taste that spun out has already begun. The source to overflowing dream can be more delicious meal complemented every material we want to provide. Is passed through the food, life scene around the world is overflowing with a smile, and aims to send colorful day. Please look forward to the future of gourmet story. 5 minute walk to the northeast the Tōkai Transport Service Jōhoku Line "Owarihoshinomiya" station. Sum Western tassel "Nobunaga-tei" right next. 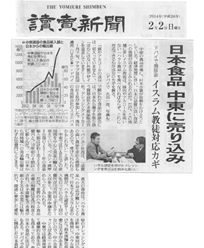 We have taken up the middle economy newspaper of April 22, 2014. 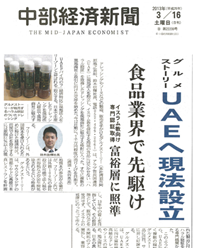 March 16, 2013, the topic on local incorporation in the United Arab Emirates, Inc. gourmet story was published in the Chubu Keizai Shimbun. 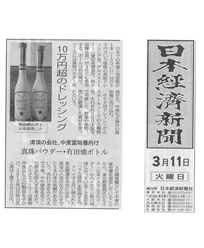 We in the Nihon Keizai Shimbun of March 11, 2014 was featured. 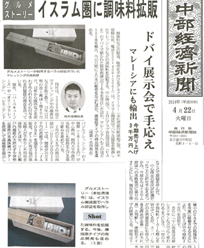 Our company Yomiuri Shimbun of February 2, 2014 was featured. 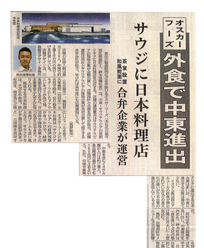 February 15, 2013, our company was featured as a case for Greater Nagoya Ministry of Economy, Trade and Industry. 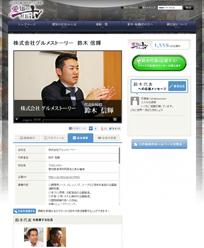 Japan's largest management web program. It has been published in the Aichi Prefecture version. Aichi is proud president (management) is walked's feelings to life and business, I have introduced a draw vision in web TV. Middle East foray in Oscar Foods eating out. 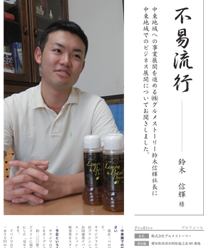 It has been published in the Central Economic newspaper under the heading of "Japanese restaurant in Saudi."